Geoff Thompson is a self-defence expert who has written several books on the subject. He also wrote the novel Watch My Back about his early years and how he became a nightclub doorman in Coventry. Thompson was approached by producer Martin Carr and playwright Jim Cartwright to ask if he would prepare a screenplay to allow his book to be turned into a feature film. 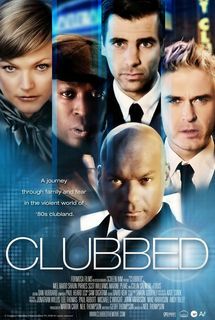 Fifteen years and two million pound of self-financing later, in January 2009, Clubbed was released. Set in Birmingham at some point in the 1980’s it tells the story of Danny (Mel Raido) who has a dead end job in a factory, he’s separated from his wife Angela (Maxine Peake) and only get to see’s his two young girls at the weekend. He lives in a flat in a high-rise council block and teeters on the edge of a mental breakdown. One weekend he gets beaten up by a thug who works for the local crime lord, a low life called Billy Hennessy (Ronnie Fox). Deciding to fight back he joins the local boxing gym and befriends Louis (Colin Salmon) who offers him a job as a bouncer at a local night club along side two other member s of Louis’s team Rob (Shaun Parkes) and Sparky (Scot Williams). At last feeling part of something, he gains the strength to stand on his own two feet, but eventually he has to face up to Hennessy which leads to some shockingly brutal consequences. Danny gets some kind words from his ex. This is the debut feature film of director Neil Thompson whose main claim to fame is directing music videos and television commercials, although he has directed two award winning short films 1997’s My Stigmata Hurts and Taxi! in 2001. The rawness of this violent movie underlines its reality. It brought to mind Nick Moran’s The Kid (2010) another film that dealt with the life of a writer, whose early life was shrouded in violence. Clubbed is not your standard British gangster movie, it has well written characters you actually care about, an underlying story that deals with the struggles of family life and the effect fear can have on a persons mental stability. For a low budget movie it’s a well made and has some convincing performances, a great 1980’s soundtrack and some good incidental music that underlines the emotions of the story. A lot of viewers will be put off by the violent content, which is a shame because you will be missing a good solid British thriller.